Lipomas are pockets of fatty tissue that develop under the skin. While there is typically not a medical reason to remove a lipoma, it is common to want this fatty tumor removed if it appears on the face. A lipoma can range in size from a small coin to a tennis ball. Regardless of size, however, it can be a source of embarrassment and even disfigurement on the face. Whether your lipoma is limiting your facial movement or an unsightly blemish that compromises your facial beauty, Dr. Harirchian can offer the excellence you deserve in facial lipoma removal. By choosing an experienced facial plastic surgeon for your lipoma removal, you can eliminate the risk of unsightly, visible scarring. Lipomas are benign fatty tumors that slowly grow beneath the skin. They can feel soft, rubbery and doughy when you press on them. Lipomas can occur anywhere on the body but most commonly develop on the upper body. While facial lipomas are not harmful to your health, they can slowly grow to a noticeable size and become an aesthetic threat to your overall appearance and facial beauty. Dr. Harirchian carries elite skill and experience when it comes to removing skin growths on the face. 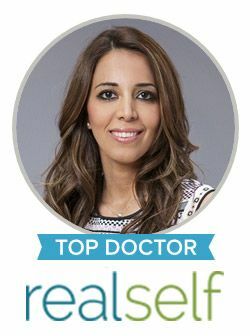 She understands the importance of using conservative, precise and minimally-invasive techniques to ensure your facial skin regains its most natural appearance. Minimizing scarring and improving healing is a top priority in lipoma removal surgery. Nearly 1 person in 1,000 are likely to get a lipoma at some point in their lifetime. Lipomas most commonly develop in adults over the age of 40. They are usually painless unless they affect a nerve or contain blood vessels. Family history seems to play a strong role in the likelihood of getting a lipoma, but these fatty growths are also associated with certain diseases, such as Cowden syndrome, Madelung’s disease, adiposis dolorosa and Gardner’s syndrome. However, the cause of many lipomas go undetermined, but this doesn’t restrict a patient’s consent to have the unsightly growth removed. The surgical removal of facial lipomas is typically a simple outpatient procedure. Most patients are given local anesthetic to numb the area so that the growth can be quickly and painlessly be removed. Using a talented surgical hand, Dr. Harirchian can remove your lipoma with careful attention to preserve your healthy skin tissues and drastically reduce scarring. Any procedure that involves your face should be performed by a trusted, experienced and highly trained surgeon. Electing to have your lipoma removed by a facial plastic surgeon can greatly affect how the surgical site heals and the long-term cosmetic results. Our goal is to remove the lipoma while allowing your skin to heal and restore itself in a seamless condition. If you have a lipoma that is on your face, we invite you to explore your options for removal with an esteemed facial plastic surgeon in Houston. Contact us today to schedule your consultation with Dr. Sanaz Harirchian.